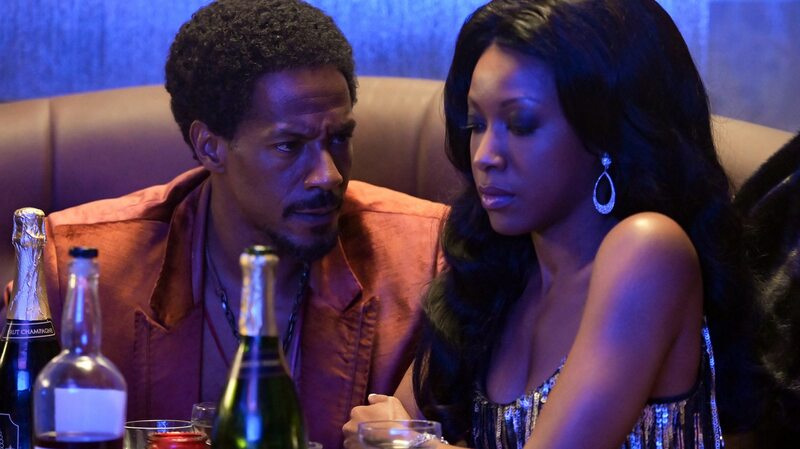 American Soul ended its first season with a bang—a performance from Ike and Tina Turner. McKinley Freeman and Gabrielle Dennis came together to play the iconic duo, but Dennis had all the attention and pressure. Just last year the actress, whose breakout role was as Janay on The Game in its resurrection on BET, turned heads with her surprising turn as Whitney Houston in BET’s The Bobby Brown Story. And now she has added Tina Turner to her repertoire. On set in Atlanta for the season one finale, Dennis, who watched YouTube videos, including the Soul Train performance she recreates, to get into character, spoke about the role while getting her hair done. She admitted that she hesitated when the role came her way because she had just played Whitney Houston. “It did cross my mind. It was kind of like ‘okay she’s just going to play all the icons,’” Dennis laughed. Ultimately she took on the role because “it’s different and it’s a one-off. It’s a one-episode situation. It’s not a mini-series, it’s not a film.” Plus, she felt in good company considering the others who have taken on roles throughout the show’s first season. Storylines that have nothing specifically to do with Cornelius’s actual life also colored American Soul’s first season, allowing folks like Kelly Price, who plays Brianne Clarke, the mother of two Soul Train dancers, to show they have other talents or giving a wider platform to Iantha Richardson who plays Tessa Lorraine, Soul Train’s lead choreographer. For Jason Dirden, who was better known for playing wayward minister Basie on Greenleaf, Gerald Aims has been a great opportunity to approach a “bad” guy differently. Playing Simone, a young woman who is a daddy’s girl in the throes of her first love and searching for stardom, has been a “learning experience” for Katlyn Nichol, a singer who was once signed to Mary J. Blige. As she has opened herself up to what acting has to offer, she has come to admire Simone’s ambition. Simone was the one who got her brother Kendall and herself on Soul Train as dancers. She was the one who pushed their group with her boyfriend JT further figuring out how to book studio time and shows. Audiences have responded enthusiastically to American Soul. The show from Jesse Collins Entertainment, which brought the groundbreaking The New Edition Story to the network, was the #1 new black scripted drama for the 18-49 demo. Wisely BET picked it, along with Lena Waithe’s Boomerang, up for a second season. “We are incredibly grateful to continue to tell the American Soul story. Season one was so well received by the culture and we feel that season two will be even more fun and exciting,” said Jesse Collins, one of the show’s executive producers, in a statement.